Dan Sarginson is hoping to see his mate Joe Greenwood back in Super League soon. Former St Helens forward Greenwood has been frozen out at NRL club Gold Coast Titans and is eyeing a move back home, with Wigan favourites to land his signature. There has even been speculation the move may materialise this year – rather than at the end of the season – following Joel Tomkins’ switch to Hull KR, a move expected to be confirmed today. Sarginson was on the Gold Coast with Greenwood last year. And as the only Englishmen at the Queensland outfit, they struck up a friendship. “He brought his girlfriend over eventually and she didn’t know many people so they branched off, but we were pretty close,” said the Wigan centre. “We had each other’s backs – I’ve always had one guy looking out for me, like when I came here with Clubby (from London). The Titans have made it clear they won’t stand in Greenwood’s way if he chooses to return home. Brother of ex-Warrior and Hull KR prop James, he played 22 matches for Gold Coast in 2017 and was in the initial England World Cup squad before it was trimmed down to 24 players. 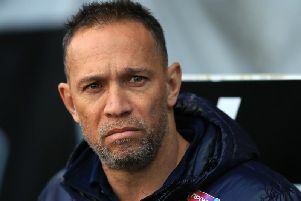 But the rangy back-rower was demoted when Garth Brannan took over as coach and, after initially vowing to stay and fight for his spot, he has been unable to force his way back into the frame. “He’s not really getting his chance in the NRL, which is unfortunate because as well as being a really good bloke, he’s a really good player,” said Sarginson. “He played (NRL) last year, but the new coach came in and he wasn’t as keen on the English imports – he wanted homegrown Gold Coast players, which was fair enough. “I said I didn’t want to be somewhere I wasn’t wanted. Tomkins, meanwhile, has agreed a move to the Robins on an 18-month deal and could make his debut for his new club against Castleford this weekend. His switch, a week after being suspended by the club and fined for the video nasty which went viral, is expected to be confirmed today. Greenwood’s arrival would also help offset the expected loss of John Bateman to the NRL at the end of the season. Bateman is still expected to join prop Ryan Sutton at Canberra next year. Wigan have already captured Zak Hardaker for 2019 and tied Willie Isa and Oliver Gildart to new deals. Meanwhile, the Warriors players were given a few days off to recharge the batteries over a long weekend. They return to training tomorrow to start preparations for Saturday’s trip to Hull FC. Liam Farrell is having an ankle injury assessed and is an early doubt for the game.